Many beautiful Art Nouveau buildings in Nancy were constructed during the Belle Époque era. Some of them are fine examples of Art Nouveau architecture designed with wrought-iron work, stained-glass and decor in ceramics. Names such as Louis Majorelle, Jacques Gruber, Émile Gallé, Jacques Gruber, Victor Prouvé, Eugène Vallin and Alexandre Bigot have acquired world-wide reputation for their work. Known as the École de Nancy (School of Nancy), they have created outstanding Art Nouveau buildings in Nancy: townhouses, shops or banks which display the clever reunion of architecture and decoration style inspired by plant-life and science. Over 250 Art Nouveau buildings in Nancy are currently listed, from the city-centre to the suburbs. Here is a list of 30 of our favourite Art Nouveau buildings in Nancy. The city-centre, located in the New Town of Charles III contains some of the finest Art Nouveau buildings in Nancy, particularly banks, shops and administrations. This iconic building used to be the headquarters of regional daily newspaper L’Est Républicain, hence its name. It was build in 1912 by architect Pierre Le Bourgeois. The vast building built by architect Pierre Le Bourgeois in 1925 was home to Nancy’s big department store “Les Magasins Réunis” who operated until a few decades ago. The initial Art Nouveau building was destroyed by fire in 1916 and rebuilt in Art Deco. The remarkable Art Nouveau building was erected by architects Émile André and Paul Charbonnier in 1910 for the Renauld Bank. The façade is decorated with friezes of fruit symbolising the city’s economic success. At the top of the spire is a stylised thistle, one of Nancy’s symbols. The prickly thistle features on the city’s coat of arms. This is a reminder of Nancy’s motto: ‘Non inultus premor’ which is Latin for ‘No one touches me with impunity’. The building now houses the BNP bank. Built by architects Gutton in 1900, the Graineterie Génin Louis was the first building with a metal structure in Nancy. It features floral decoration by glass artist Gruber. It now houses a HSBC bank agency. A large wooden window built by architects Charles André, Émile André and Eugène Vallin in 1901. It is now occupied by a clothing store. The house of Dr Aimé was built by architects Georges Biet and Eugène Vallin in 1903. It is home to a bank agency of Société Générale. The construction of this emblematic restaurant was entrusted to architects Lucien Weissenburger and Alexandre Mienville in 1910 opposite the railway station, across Place Thiers. The sober exterior façade of the building contrasts with the stunning interior decorated with vegetation and exotic themes. The restaurant is still operating today and has become an institution for locals and tourists alike. Architects Louis Marchal and Émile Toussaint built the headquarters of the Chambre de Commerce et d’Industrie of the Meurthe-et-Moselle département in 1908. The stained glass windows designed by Antonin Daum and Jacques Gruber on the ground level depict the landscapes of Lorraine while the wrought-iron work is by Louis Majorelle. The Pharmacie du Point-Central is located at the corner of Rue Saint-Dizier and Rue Saint-Georges. The building features two styles of decoration: Art Nouveau and Art Déco (following the renovations of 1922). Owned by pharmacist Louis Godfrin, its façade displays a fine blue ceramic mosaic by Parisian ceramist Ebel. Situated just round the corner from Place Stanislas, the former Goudchaux Shop, now a bank agency, was built by Eugène Vallin in 1907. The Margo building was built in 1906 by architects Eugène Vallin and Paul Charbonnier on Rue Stanislas. Built by architect Georges Biet in 1899, the Gaudin House features stained-glass windows by Jacques Gruber. The park of Saurupt is located to the South of the city-centre, on the west side of the railway line. The garden estate of Saurupt was laid out in 1901 by Jules Villard who wished to create a vast Art Nouveau domain of 100 villas. However, only 6 houses were completed. Built in 1902 by Émile André and Henry Gutton as the Caretakers’ Lodge at the entrance to the Saurupt estate. Built in 1902-1904 by Émile André. Built in 1904 by Émile André. Built in 1903-1905 by Joseph Hornecker. Built in 1905-1906 by Lucien Weissenburger. Built in 1908-1910 by Léon Cayotte. It features stained-glass by Jacques Gruber. Located outside the Saurupt Park but in walking distance. A fine Art Nouveau townhouse built in 1905 along the railway tracks by Henri Gutton and Joseph Hornecker with sculptures from Léopold Wolff. The residential district around the Sainte-Marie park contains many Art Nouveau buildings and notably the famous Museum of École de Nancy. There, the streets are lined with front gardens of family houses. The swimming complex of Nancy Thermal is one of the highlights of this residential suburb. 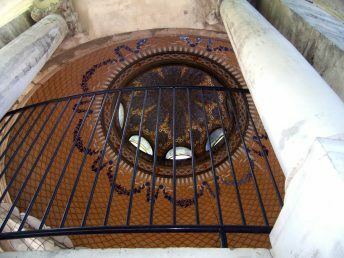 The swimming pools are supplied by an eight-inch stream of warm water (36 °C) that was discovered on a drilling site by architect Lanternier in 1908. 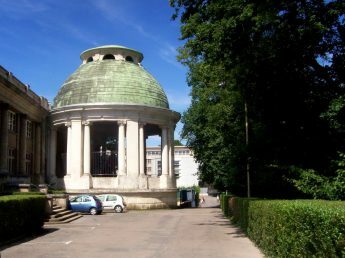 The source was inaugurated during the International Exhibition of the East of France which was held in Nancy from May to November 1909. Architect Louis Lanternier built the baths assisted by Gentil-Bourdet for the ceramics between 1910 and 1913. At the time of the inauguration of the swimming complex in 1913, the olympic pool (50 m x 18 m) was the largest in the world to be supplied by thermal water. Built in 1911-1912 for Eugène Corbin, the most important patron and collector of École de Nancy artwork, it now houses the Musée de l’École de Nancy (School of Nancy Museum). The garden of the museum, with its fountains and flowerbeds, was completely renovated in 1998.
an aquarium pavilion designed by Lucien Weissenburger with stained-glass windows by Jacques Gruber. a funerary monument (1901) by architect Girard and Parisian sculptor Pierre Roche, which used to stand at the Préville cemetery. an oak door from 1897 by Eugène Vallin which was designed for Émile Gallé’s workshops on Avenue de la Garenne, Nancy. The Biet House was built in 1907 by Georges Biet and Eugène Vallin. The Renaudin House was built in 1902 by architect Lucien Bentz. 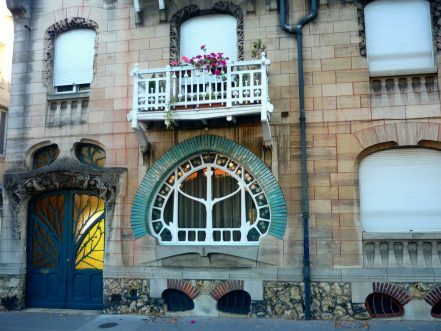 The street includes 17 houses that were painted between 1900 and 1910 by architect César Pain. A block of three adjacent houses include beautiful floral Art Nouveau painting (Les Clématites and La Tatiana). These two residential streets between the Railway tracks and Ste Marie Park have been named after the famous Art Nouveau artists from the School of Nancy. They are bordered with fine townhouses, some of them of Art Nouveau style. From the railway station to the direction of the suburb of Laxou, Avenue Foch and the adjacent streets contain beautiful Art Nouveau townhouses, including the famous Villa Majorelle. Built between 1901 and 1902 by Parisian architect Henri Sauvage in collaboration with Lucien Weissenburger, the villa is arguably the finest example of Art Nouveau architecture in Nancy with multiple bow windows and floral motifs on the façade. Louis Majorelle created himself the ironwork, furniture, and the grand staircase. Majorelle had Jacques Gruber to work on the stained-glass windows and Alexandre Bigot on the large ceramic Art Nouveau fireplace. Built by architect Paul Charbonnier. Wrought-iron work by Louis Majorelle, stained-glass windows by Jacques Gruber and sculptures by Léopold Wolff. To the North of the railway station lies the Cours Léopold, and the districts of Boudonville and Scarpone. 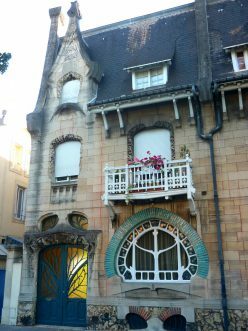 Many interesting Art Nouveau buildings are found there, notably the Maison Huot on Quai Claude le Lorrain. The Kempf house is located on the long esplanade of Cours Léopold. It was built by architects Félicien and Fernand César in 1903. Easily recognisable with its gable, the Art Nouveau house was built by architect Lucien Weissenburger as his residence in 1903-1904. The stained-glass windows are the work of Jacques Gruber and the wrought-iron work by Louis Majorelle. Situated on a street bordering the railway line from Nancy to Metz, the Huot house was built in 1903 by architect Émile André. It features stained-glass windows by Jacques Gruber.